D David Hájek (Spokane, 1998-99) has been released by Bad Neuheim (Germany, DEL2). His contract expired on Dec. 31. He had two goals and five assists in 12 games. . . .
D Rory Rawlyk (Medicine Hat, Vancouver, Prince Albert, Red Deer, 2000-03) has been released by the Coventry Blaze (England, UK Elite). He had six goals and 14 assists in 34 games. Rawlyk requested his release “to take up a career opportunity outside of hockey in North America” per Blaze press release. . . .
D Ryan Button (Prince Albert, Seattle, 2007-11) has signed a two-year extension with the Iserlohn Roosters (Germany, DEL). The extension runs through the 2016-2017 season. Button has dual German/Canadian citizenship. He has four goals and 11 assists in 30 games this season. When Saturday’s games began, the WHL’s standings showed 15 of its 22 teams with winning percentages of .500 or better. . . . But only 10 of those 22 teams actually had more wins than losses. . . . After Saturday’s games, the numbers were 15 and 11 as the Portland Winterhawks won to get to 20-20 (20-17-3). The OHL’s Sudbury Wolves fired head coach Paul Fixter on Saturday, with associate coach Dave Matsos being named interim head coach. . . . Bryan Verreault stays on as an assistant coach. . . . The Wolves, at 7-25-1-1, have the OHL’s poorest record. 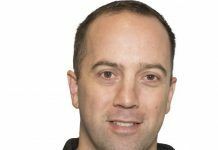 They were beaten 7-0 by the visiting Ottawa 67’s on Friday. . . . Fixter had a 40-49-4-9 record as Sudbury’s head coach. Bill Chow, the president of the SJHL, delivered a president’s message on Thursday. In that message, he included details of an SJHL draft, the first of which will be held during the AGM in the first week of June. Details are right here. 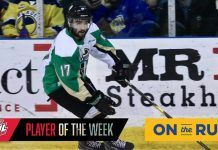 In Moose Jaw, the Warriors scored five goals on eight second-period shots as they beat the Prince Albert Raiders, 8-2. . . . F Jesse Shynkaruk scored three times for the Warriors, giving him six this season. He’s got five goals in 18 games since being acquired from the Kamloops Blazers. . . . F Tanner Eberle added two goals for Moose Jaw, giving him 23, while F Jack Rodewald scored his 19th goal and had two assists. . . . After a scoreless first period, the Warriors scored four times in a span of 8:21 in the second. . . . Warriors G Zach Sawchenko stopped 25 shots. . . . The Warriors were 2-for-3 on the PP; the Raiders were 0-for-4. . . . Prince Albert is without D Tomas Andrlik, who suffered an ankle injury while playing with his billets on an outdoor rink. . . . The Warriors (16-20-4) snapped a seven-game (0-6-1) losing skid. . . . The Raiders (16-23-1) have lost five in a row, scoring only six goals in the process. . . . The Warriors are fourth in the East Division, three points clear of the Raiders. Moose Jaw is six points behind the third-place Swift Current Broncos and seven points out of a wild-card spot. . . . In Saskatoon, F Kohl Bauml scored twice to lead the Everett Silvertips to a 6-2 victory over the Blades. . . . Everett is 2-0-0 on its six-game East Division swing. . . . F Sam McKechnie got Saskatoon on the board first, with his 14th goal, on a PP, at 6:54 of the first period. . . . The Silvertips scored the game’s next five goals. . . . Bauml, who is from Saskatoon, has 17 goals. He tied the game at 8:17 of the first and gave his guys the lead 28 seconds into the second on a PP. . . . Everett F Nikita Scherback, who was acquired from Saskatoon early in the season, had two assists. . . . Saskatoon G Nik Amundrud, who began the season with Everett, gave up five goals on 20 shots before being replaced by Trevor Martin at 9:16 of the second. . . . Everett D Noah Juulsen also had two assists. . . . Everett G Carter Hart stopped 26 shots in winning for the second time in as many nights. . . . Saskatoon F Garrett Armour was given a charging major and game misconduct at 9:48 of the second period. . . . Everett was 3-for-4 on the PP; Saskatoon was 2-for-3. . . . The Silvertips now are 23-11-4. . . . The Blades (9-28-3) have lost three in a row. . . . Daniel Nugent-Bowman of the Saskatoon StarPhoenix has a game story right here. . . . In Brandon, F Morgan Klimchuk broke a 4-4 tie at 5:43 of the third period and the Wheat Kings went on to a 7-4 victory over the Calgary Hitmen. . . . Klimchuk, who also had an assist, scored his 15th goal in his first game with his new team. He was acquired from the Regina Pats on Friday. . . . Calgary F Jody Stallard, who is from Brandon, gave the Hitmen a 3-1 lead with his fourth goal at 7:01 of the second. . . . The Wheat Kings took a 4-3 lead on goals from F Rihards Bukarts, his 14th, F Nolan Patrick, his 17th, and F Jayce Hawryluk, his 17th, in a span of 3:34 late in the period. . . . Calgary D Michael Zipp scored his second goal of the game, and sixth of the season, at 4:05 of the third to tie it at 4. . . . Patrick also had two assists, while Hawryluk finished with two goals and an assist. He added one of Brandon’s two empty-net goals. F Tim McGauley got the other, his 25th goal this season. . . . Brandon D Ryan Pilon had three assists and was plus-4; D Macoy Erkamps had one assist and also was plus-4. . . . The Wheat Kings (29-7-4) have points in 10 straight (8-0-2). . . . The Hitmen, who play in Regina tonight, are 20-15-3. . . . Calgary, Kootenay and Edmonton are tied for third place in the Central Division. . . . Rob Henderson of the Brandon Sun has a game story right here. . . . 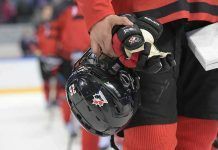 Prior to the game, the Wheat Kings announced that F Ty Lewis, 16, had been sent to the midget AAA Wheat Kings for the remainder of this season. Lewis, a third-round pick in the 2013 bantam draft, is from Brandon. He suffered a broken arm in training camp and missed a lot of the season, getting into only two games with the WHL Wheat Kings. . . . Lewis had two goals and an assist on Saturday as the midget AAA Wheat Kings beat the Winnipeg Thrashers, 6-2. . . . In Edmonton, F Davis Koch broke a 1-1 tie at 14:00 of the second period as the Oil Kings beat the Kootenay Ice, 3-1. . . . Koch has two goals this season. . . . Edmonton F Brett Pollock opened the scoring at 10:16 of the first, scoring his 17th on a PP. That was Edmonton’s first PP goal in five games. . . . The Ice tied it on F Matt Alfaro’s sixth goal at 10:12 of the second. . . . Edmonton F Lane Bauer got his 11th goal into an empty net at 19:18 of the third. . . . The Ice was 0-for-7 on the PP; the Oil Kings were 1-for-3. . . . Edmonton G Tristan Jarry stopped 32 shots, three more than Kootenay’s Wyatt Hoflin. . . . The Oil Kings were able to dress only 10 forwards, and only four of those are veterans of the Memorial Cup-championship team. . . . The Oil Kings (19-16-5) have won three in a row. 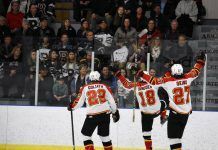 The victory allowed them to pull into a tie for third in the Central Division with Kootenay and Calgary. . . . The Ice (21-18-1) had points in each of its previous seven games (6-0-1). . . . Prior to the game, the Ice announced that D Tanner Lishchynsky will stay with the team for the remainder of the season. He went into last night with two assists in four games. A Saskatoon native, he had been with the SJHL’s Flin Flon Bombers. Lishchynsky, who turns 20 on Monday, was a 10th-round pick by the Vancouver Giants in the 2010 bantam draft. . . . In Lethbridge, D Brett Cote scored in the sixth round of the shootout to give the Red Deer Rebels a 3-2 victory over the Hurricanes. . . . Lethbridge F Ryley Lindgren and Red Deer F Brooks Maxwell also scored in the shootout. . . . Red Deer F Preston Kopeck forced OT with his 10th goal at 18:09 of the third period. . . . The Hurricanes took a 2-0 lead into the second on goals by F Miles Warkentine, his second, and F Tyler Cooper, his 12th. . . . Red Deer D Nelson Nogier scored his second goal of the season at 17:53 of the second. . . . Lethbridge G Stuart Skinner stopped 36 shots, five more than Red Deer’s Rylan Toth. . . . 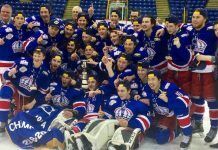 The Rebels improved to 21-14-5 and remain second in the Central Division. . . . The Hurricanes (9-23-6) have lost four straight. . . . In Medicine Hat, G Marek Langhamer turned aside 46 shots, including 25 in the third period, to lead the Tigers to a 2-1 victory over the Swift Current Broncos. . . . Tigers F Chad Butcher returned from injury to score his 12th goal of the season at 7:11 of the second period. He hadn’t played since Dec. 7, missing seven games with a concussion. . . . Tigers F Curtis Sanford notched his 31st at 7:36 of the third. . . . Broncos F Zac Mackay scored his fourth goal, shorthanded, at 10:45 of the third. . . . Broncos G Landon Bow stopped 30 shots. . . . Each team was 0-for-2 on the PP. . . . Tigers F Trevor Cox, who leads the WHL with 65 points, had one assist. . . . The Tigers (27-9-2) have won three straight. . . . The Broncos (19-17-4) have lost two in a row. . . . In Kamloops, the Blazers scored twice in a shootout and beat the Vancouver Giants, 3-2. . . . F Deven Sideroff got the winner in the fourth round, after teammate Jake Kryski and Vancouver F Jackson Houck had earlier shootout goals. . . . Vancouver D Josh Thrower’s third goal of the season, at 16:15 of the third period, forced OT. . . . Kamloops F Matt Revel had broken a 1-1 tie with his 14th goal at 9:04 of the third. . . . Kamloops F Deven Sideroff opened the scoring, with his 14th, at 7:17 of the first. . . . Vancouver D Anwar Atwal scored his fifth at 18:41 of the first. . . . Kamloops G Connor Ingram stopped 43 shots, while Vancouver’s Cody Porter turned aside 32. . . . Referees Kevin Bennett and Mike Langin officiated a penalty-free game. . . . Kamloops F Matt Needham picked up his 100th career assist on the game’s first goal. . . . Among the Blazers’ scratches were two of their 20-year-olds, D Brady Gaudet, who is injured, and F Mike Winther, who hasn’t scored since Nov. 19. . . . D Conner McDonald, a second-round pick in the 2014 bantam draft, made his WHL with the Blazers. . . . Kamloops (14-23-5) had lost its previous five games. . . . The Giants (18-19-2) had won their previous two games. . . . The loser point allowed Vancouver to pull into a tie with Prince George for third in the B.C. Division. They are five points ahead of Kamloops. . . . Kamloops F Luke Harrison wasn’t suspended by the WHL after taking a charging major and game misconduct in the third period of a 6-4 loss to the visiting Kelowna Rockets on Friday night. . . . In Portland, G Adin Hill stopped 35 shots for his first WHL shutout as the Winterhawks dumped the Tri-City Americans, 3-0. . . . The Winterhawks held a 50-35 edge in shots. . . . F Evan Weinger’s sixth goal, at 8:55 of the second period, got Portland started. . . . D Anton Cederholm got his fifth at 2:38 of the third and F Miles Koules scored his 14th into an empty net at 18:08. . . . F Keegan Iverson had two assists. . . . Tri-City D Brandon Carlo was back after playing with the U.S. side at the World Junior Championship. . . . The Winterhawks had F Chase De Leo back after his time with the U.S. team. . . . D Layne Viveiros was among Portland’s scratches. . . . The Americans dressed 17 skaters, one under the maximum. D Tyler Fraser, 17, played his first game this season. . . . F Austin Gray played his first game with Portland. He plays for the Prince George-based Cariboo Cougars and leads the B.C. Major Midget League in scoring, with 46 points in 25 games. . . . The Winterhawks (20-17-3), who entertain Seattle tonight, ended a three-game losing skid. . . . The Americans (18-18-2) have lost three in a row (1-1-1). . . . In Victoria, F Austin Carroll broke a 2-2 tie at 11:57 of the second period and the Royals went on to a 4-2 victory over the Spokane Chiefs. . . . 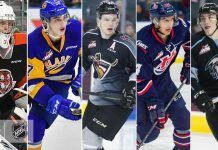 The Royals had beaten the visiting Chiefs 8-1 on Friday night. . . . Carroll has 26 goals. . . . Spokane F Kailer Yamamoto’s 16th goal, at 19:30 of the first, on a PP, gave his guys a 2-1 lead. . . . Victoria D Travis Brown tied it with his 15th at 8:49 of the second. . . . Royals F Tyler Soy scored his 13th into an empty net at 19:14 of the third. . . . Spokane F Adam Helewka got his 20th goal of the season. . . . The Royals (20-18-3) have won three in a row. . . . The Chiefs (21-14-3) have lost two straight. . . . The Royals beat the Chiefs 8-1 on Friday night. . . . In Kelowna, F Tomas Soustal scored his first goal since Nov. 15 and it stood up as the winner as the Rockets beat the Prince George Cougars, 4-3. . . . Soustal, a Czech freshman, has six goals. He had gone 17 games without a goal. . . . Soustal’s goal, at 12:14 of the third period on a PP, gave the Rockets a 4-2 lead. . . . Cougars F Cal Babych got his fourth goal at 13:35. . . . Kelowna F Nick Merkley had a goal, his 13th, and an assist as he reached 61 points, four off the league lead. . . . Prince George F Brad Morrison had three assists. . . . The Rockets (31-6-3) have won two in a row. . . . The Cougars (19-21-0) have lost two in a row. . . . F Ethan O’Rourke, a 15-year-old from Penticton, made his WHL debut with the Cougars. 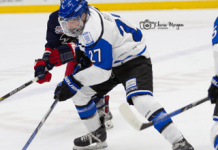 He was a third-round selection in the 2014 bantam draft and now plays for the Okanagan Hockey Academy. “: Now hearing Hobbs to Regina for Morgan Klimchuk. Hearing deal was done days ago’ This one still happening? no I corrected my tweet, you should pay more attention if the Blazers will let you. you mean the Malcom CAmeraon that turned down the job because of term? sorry you seem so jealous and petty. maybe you should spend less time pumping your own tires on here and actually put in the work to get things right the 1st time. sorry that you aren’t allowed to break things or maybe don’t have the sources not sure what it is. But it’s petty. stop following if you don’t like it. I’m done with you.